Over the past several months, Foursquare has had a number of impressive stats for a startup. Some of them involved SXSW, some involved overall check-ins numbers, some involved deals signed. But at the end of the day, the most important metric for any service remains number of users. And Foursquare is doing pretty well there too. 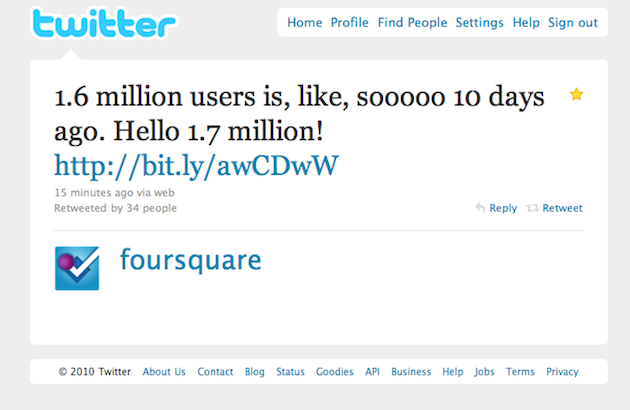 The location-based service has just tweeted out that they’re now past 1.7 million users. Impressively, that’s up 100,000 users from just about a week ago. Also impressive from this angle, it was only two months ago that Foursquare passed one million users — clearly the rate of growth is increasingly quickly. At this rate, Foursquare will surpass 2 million users in July. MyTown, another location-based network hit that number in May, but it’s more of a game than a standard location-based network. Another location-based network, Brightkite, hit 2 million users in February. Meanwhile, rivals Loopt and Google Latitude both have 3 million users. At this rate of growth, Foursquare could surpass many of its rivals in terms of size fairly soon. Of course, Loopt with its new background-enabled iPhone app, and Latitude with its new API, may have something to say about that.